Ice and Icing | Cold climate science with deviations into cake. Cold climate science with deviations into cake. Larsen C Iceberg has finally gone! After months of intense scrutiny and media attention the Larsen C iceberg (now known by the catchy name A68) finally broke away from the ice shelf. To hear about just how big this berg is (how big even is Luxembourg eh, The Guardian?) I went on BBC Radio Berkshire to talk about this trillion ton ice cube, you can listen here. Should I bet on an iceberg? What is going on with Larsen C? The ice shelf that my PhD is based on last week hit the headlines with the news that a crevasse in the ice shelf had grown suddenly, and now an iceberg of about 5000 sq km (that’s about 1/4 the size of Wales to use the internationally recognised unit for big things) is set to break away from the ice shelf. Should the iceberg break off it will be one of the top 10 biggest every recorded. The crevasse between Larsen C and the potential ice berg (image NASA). However, the big news among glaciologists is surely that that things we find exciting have finally made it in the big time: Paddy Power are offering odds on when the iceberg will detach (or calve to give it its technical name). So is it worth a punt? However, before you go splashing all your cash on January and February remember there is still 20 km of ice holding that iceberg on, which is still a fair distance. We also don’t yet know what caused the sudden growth of the crevasse at the end of last year. Large break up events tend to happen in the Antarctic summer (i.e. our Winter) so if it’s going to happen and it’s not in the next month or two it may well not be until next year. So that narrows things down quite a bit but there’s still a bit of guessing to be done if you feel this is more worthy of your money than guessing how many goals Chelsea will score against Leicester on Saturday which I’d personally recon as being a much safer bet. Its breaking away won’t contribute to sea level rise (it’s already floating on the ocean so it has already displaced its own weight in the water), but it may make the ice shelf less stable. aAlthough previous ice shelf collapses such as that of Larsen C’s former next door neighbour Larsen B did follow big iceberg events, there was significantly more melting observed on Larsen B prior to this, so a sudden collapse of Larsen C is still unlikely. However, if Larsen C did collapse it could lead to sea level rise through the glaciers that used to flow onto the ice shelf speeding up and flowing into the ocean. And remember, please gamble responsibly. And that does not mean signing up for your free bonus bets and then putting them on Barnet FC to get promoted. That would be silly. With Christmas fast approaching many PhD students will be feeling some trepidation about returning home and facing questions about their PhD, ‘when will you be done?’ and such. I wrote this blog as a result of looking for something to send my family to explain why some questions are just a bad idea and I couldn’t find it- there’s lots of advice for people who are parents doing PhDs but not so much for parents of PhDs. Chances are you want to ask these questions because you are genuinely concerned for someone’s progress and wellbeing and then are justifiably upset when they may snap/ cry/ run away in response. In academia an unusually high proportion of peoples’ social circles will have or be doing a PhD and it’s very easy for us to forget that most people who are clever enough to steer well clear of academia will have no idea what you’re doing, why you’re doing it or what it involves. There are plenty of stats out there that start to suggest just how hard a PhD and academic life can be: 47% of graduate students suffer from depression, 10% have contemplated suicide, 53% of UK academics have mental health issues etc. and most family and friends will want to help ease those pressures where they can. So here I hope to go some way to explaining why some unexpected questions or comments are quite so unhelpful. Thank you to everyone who contributed ideas or improvements. 1.When will you be done? A PhD is a new piece of research. No-one has ever done it before. Sometimes it goes smoothly, more often that not it doesn’t. If we knew how it would go it wouldn’t be new. No-one wants it done more than us. Reminding us that it’s not finished yet adds to the irrational guilt we all have that we’re somehow failing by not being done yet with the thing that justifies our entire existence for the last few years. We’re already under time pressure to do it before our deadline/ the money runs out. There are also factors out of our control (how long it takes our supervisors to read our drafts, how long we have to wait for lab/ computer time) so it’s often not even something we can make happen any quicker, much as we’d really really really like to. 2.Have you got a job yet? This also comes in the form of ‘what are you doing next’ or worse ‘when are you getting a real job?’. PhDs are pretty full on, and the final stages when they’re most full on is the time this question crops up the most. It’s likely fine to ask what we’d like to do next, or if we’d like to stay in research if you want to know our plans. But reminding us that we don’t yet have ‘real’ employment following submission is just adding to the guilt of someone who would very likely love to be able to send in a bunch of job applications but doesn’t really have the time given that they’re doing some crazy amount of hours a day writing the thesis. Or rerunning all their work and rewriting the thesis. Definitely don’t ask then. I wish. Actually I’m working way harder than I would have done in my nicely paid graduate job for less than half the money. This is probably because I once thought I loved what I do and it was worth it. Now I no longer have the ability to love anything… (I joke, but seriously…). 99% of PhDs I know work incredibly ****ing hard. We don’t come in at 9 and go home at 5 and switch off. We check our simulations at midnight on a Sunday and end up going back to the office after having allowed ourself an hour or two off to go to the pub. * We might have the flexibility to have the odd midweek morning off but this only means we just end up staying a whole lot later when we do. There may be the odd person who can derp around for 3 years and then write it all at the end but they are definitely the minority. And we don’t get massive holidays in the summer or break up for Christmas. *Yes I’ve done it and some of my best work has come out of this. Also some of my very worst where I made some ice melt by making it colder or the time I worked so late I forgot I owned a bike and walked all the way home. Current PhD students maybe don’t follow in my footsteps. 4. What is the point of what you do? Are my taxes paying for this? What use will this have in the real world? If our research is funded then it goes without saying the someone important (or more likely several people) thought it was worth funding. We constantly have to justify our research in transfer reports, papers, thesis, every talk ever. Sometimes we just don’t want to do that any more. If you’re genuinely interested then that’s great and we probably will happily talk about it and why it matters, communication science is great and important, but if I’m not aggressively asking you to justify your job then I think it’s only fair to ask you to do the same. How quickly you get to the end of your research is often pot luck and vastly unrelated to how hard you work. As I said above, it’s new. Some people get lucky and get it done quickly, the rest of us just try not to hate them too much. Even in academia people get it wrong all the time. Fair brother Lecture now on YouTube! *Note the accurately diamond shaped sea ice floe rheology ( or ‘the shape the ice goes when there’s lots of it in bits’). My supervisor was the internal examiner so this was super important. My PhD has so far taken me to some pretty exciting places and I’ve been lucky enough to secure some travel grants that have allowed me to really make the most of my allocated travel money. However, despite the fact that my friends and family seem to think I’ve been constantly off on holiday conferences are actually pretty hard work and essential for making a career for yourself in the scientific world. Recently I wrote about my experiences at a small meeting in Iceland. Small meetings tend to have a set programme, you all see all of the talks, everyone has lunch together and you have a chance to speak to the bulk of the people at the meeting. My other conference trip last year was to the American Geophysical Union’s Fall Meeting in San Francisco and was completely the other end of the scale. With over 23,000 attendees it is the largest Earth and Space science meeting in the world, and is spread across 3 buildings. At any one time there are many talks going on as well as multiple poster sessions; here the poster session is the size of several football fields. A small fraction of the poster hall at AGU. Given this, I was slightly sceptical about how much I was going to get out of the meeting. Even though I had put in the effort to be prepared for what I wanted to see the first couple of days were exhausting and I didn’t feel like I was picking much up. Even simple things like going for dinner were quite hard work with limited WiFi and even though I knew plenty of people there I kept missing many of them. The icebreaker reception was pure chaos- the crowd outside waiting for the free beer and merchandise from the exhibitors reminded me of the crowds you see on the news for black friday! However, once I got over the jet lag a bit things went up hill. I realised my brain was too saturated with science on Wednesday to take in much more and instead joined to queue to watch Al Gore speak (a definite advantage of a larger conference)- he was very into the space science he was talking about, funny and nothing short of inspirational at the end. Words I’d never expect to use about a politician. It was also nice to have dinner with my UCL colleagues, and catch up with old Reading colleagues and Karthaus friends throughout the week. The former Vice President. I went to see him but he didn’t return the favour. Rude. Thursday was a very early start for my talk but I was glad there were still quite a few people there for the time of the morning. Straight after my talk I had responses on twitter and the next day at the poster session I spoke to several people who were interested in my work and able to offer help and advice, or were just starting out on their PhDs and wanting to know more. Giving my talk. Unfortunately no-one ever sits near the front but there were a lot of people there, honest! Thanks to Nat Melia for photographing. It is these interactions that make the conferences so useful and so essential. Not only have I found help with my own work, I may be able to help others with theirs and collaborate in the future. You also get a good idea of what other people are working on so you know where there could be gaps to look at things in the future. It’s a weird old world in science as we are all at the end of the day often rivals for the same pots of funding, but we also all need help from others to get to where we need to be. Meetings like AGU are essential for this and also good for just getting to know what’s going on more generally in your field- Iceland was great but it was very specific. AGU gave me chance to watch big keynote speakers such as Eric Rignot talking about sea level rise, the notes from which will definitely be useful for putting my PhD in context both in my viva any upcoming Fairbrother public lecture. *The last one in the world in fact and therefore probably the only one where coming last is a more exciting achievement than winning. I almost feel that this post should be categorised under ‘ice’ as well as ‘icing’ as if there’s one thing that gets me through research it’s definitely tea. So what better way to enjoy tea than in cake form? These use a standard sponge cake recipe and buttercream frosting. However, the difficulty is getting the Earl Grey flavouring to come through. 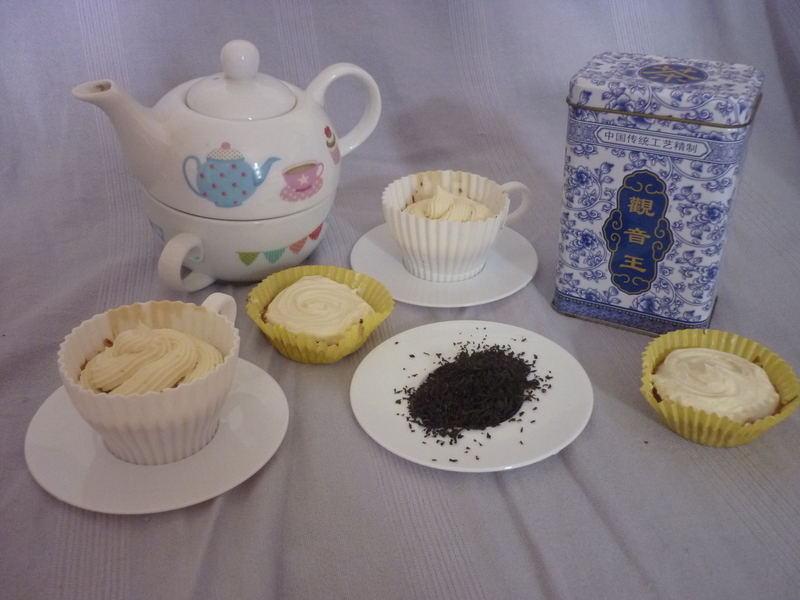 I find it’s better to use tea leaves rather than bags and also to add the Earl Grey to the icing too. 1. Brew the tea leaves in the boiling water for a good 10 minutes. Pre heat the oven to 180 degrees C, gas mark 4. 2. Cream together the butter and sugar, and mix in the eggs. 3. Strain the tea leaves from the water and add the water to the mixture. 5. Two thirds fill cupcake cases with mixture and cook for around 20 minutes, until the cakes begin to come away from the cakes and are springy. 6. Brew the tea leaves for the icing as before. 7. Mix together the butter and icing sugar for the icing. Strain the tea leaves from the water and add the water to the milk. 8. Add the milk mixture to the icing slowly until you have the desired consistency for decorating the cakes. 9. Enjoy with a cup of tea, naturally.